Tampa Bay Times columnist Tom Jones looks back at the best and worst from Thursday's Valspar Championship at Innisbrook. Times sports writer Thomas Bassinger ran into a famous face while walking the Copperhead Course: former Phillies All-Star shortstop Jimmy Rollins. For Rollins, who played in the majors from 2000-16 and now lives in Tampa, Thursday was his first chance to see Tiger Woods in person. "Everybody loves a comeback story, right?" Rollins said. "But everybody also loves a hero. (Woods) was that. He represented so much." Woods' success inspired the black community, Rollins said. "You felt good when Tiger won, when he did well," Rollins said. "He was attracting young black people to play golf. Before that, a lot of people I know didn't play golf. They all cared about Tiger Woods and what he did on the golf course. (They said) 'Let me go grab a club and see what it feels like.' "
It was a cool day for Baylin Parra, a 13-year-old from Palm Harbor Middle School. Not only did she get to skip school (shh, don't tell her teachers), but she got to hang out with Tiger Woods. Well, sort of. Parra was the standard bearer for the playing group of Woods, Jordan Spieth and Henrik Stenson. That means she carried the sign with the scores of the players and walked alongside them during their round. Parra got the chance because she takes lessons at the Chi Chi Rodriguez Golf Club. Her dad, George, got her interested in playing when she was 5, but she didn't start lessons until a year ago. She knew she was going to be a standard bearer Thursday but had no idea she would get Woods' group. "When I found out," Baylin said, "I was pretty excited." Baylin did great, partly because her mom and dad came to the rescue and allowed her to finish strong by each giving her a bite of their ice cream after the 15th hole. Spotted in the gallery: the Northern Michigan women's golf team. It's in town for a tournament at Saddlebrook in Wesley Chapel. "We knew this tournament was here," junior Alyce Krumm said, "but when we found out Tiger and Jordan (Spieth) were in it, we knew we had to come over here." 1. You watch really good players slug their way around the Copperhead Course, with sloped greens and plenty of elevation, and you realize there might not be a tougher course in the state. 2. Too bad Jordan Spieth had such a crummy day, shooting 5-over 76, two shots off last place. Though Tiger Woods is the big story, Spieth is a major name, and it would be a shame for Valspar if he isn't here for the weekend. 3. 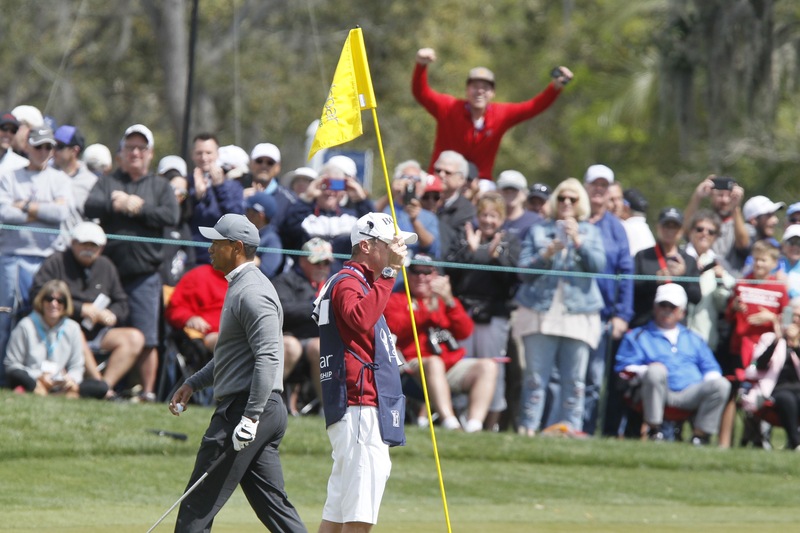 Only a few idiots yelled idiotic things during Woods' round. There was only one ugly moment when Woods had to stop mid swing from a bunker when someone yelled what sounded like, "Break!" Woods gave an ugly stare, backed away and recovered to knock his shot to within a few feet of the hole. At least Tiger Woods gave Phil Mickelson a few days to revel in becoming the oldest player to win a World Golf Championship event with his win last weekend in the Mexico Championship. At 47, Mickelson ran his streak of top-10 finishes this season to four. In an appearance Thursday on the Dan Patrick Show, Mickelson saluted Woods as the rival who, among other things, "elongated my career." But he's braced for what could come this weekend. "We've become pretty close in recent years," Mickelson said. "But (Woods has) always one-upped me. I wouldn't be surprised if he went out and won this weekend to one-up me again."